Manaan is likely to be the third planet that you visit and as such you should make sure you have read the first paragraph of the Leviathan before proceeding. Anyways just like Tatooine and Kashyyk, you will be required to pay a docking fee of 100 credits in order to be able to leave the docking area, though you cannot persuade him to reconsider normally (force persuade still works). As soon as you have access to Manaan various side-quests become open to you. Anyways proceed to East Central and in the north east you will find the Republic Embassy. Ask Roland Waan about the Star Map, and he will agree to tell you what he knows if you will help him. He asks that you enter the Sith Embassy and retrieve a republic data module that fell into their hands. You can't progress with the main quest unless you comply, so agree to do so. Don't mind him when he says that you have to hurry, since there is no time limit in the game to complete this quest. There are three ways to enter the Sith Base. Since you don't gain any XP for completing more than one means of entrance there is no need to do so. The first way is to interrogate the Prisoner and have him give you the passcode. This can be the most difficult of the three options, if you don't have any means of knowing the conditions whereby you can successfully persuade the prisoner. Also having a low persuade skill can compound the problem. If you don't have any ranks in persuade it is still possible, but it can be difficult. While he says that injecting the antidote too many times can cause memory loss, don't worry as there is no limit to the number of times you can question him. "Relax. I'm not here to threaten you. " Threshold +1. "We know about your companion. " Threshold +2. "Maybe we should do something about Tela. " Threshold +3. As you can see from the above list that there are many possible ways of persuading him, but the most straight forward way is to simply talk about Tela and successfully persuade him all three times, making sure you save one of the easy persuade checks for last. As long as you have some ranks in persuade this is probably the simplest method. However since this requires that you pass a medium persuade check, it is impossible if you have not put in any ranks in persuade. Interestingly since you can always say "Lets try something else" and return to the original options, you can gain threshold points easily without making any persuade checks. Therefore one of the easiest ways of persuading him having no ranks in persuade is to get 7 threshold points just by using the three main options and then asking one of the easy questions last. For example say "We know about your companion." twice then choose "Maybe we should do something about Tela", and finally "Talk or something may happen to her." You should succeed 40% of the time even with no ranks in persuade. If you fail that persuade try "We have her already. She may be spared if you talk." and you'll likely succeed one of the two checks. Remember you can start over any number of times, so don't worry if you fail. The second method of entering the Sith Embassy is by decrypting one of the passcards that they stole from the Sith. All you have to do is solve several easy problems in pattern recognition. They even give huge hints to the answer to each problem. The sequence of numbers go as follows, Additive, Subtractive, Multiplicative, Divisive, Exponential, and finally Logarithmic. Here are hints for each sequence as they appear. The Additive sequence increases the previous number in the sequence by a certain (increasing) value. The Subtractive sequence decreases the previous number in the sequence by a certain (decreasing) value. The Multiplicative sequence multiplies the previous number in the sequence by a certain value. The Divisive sequence divides the previous number in the sequence by a certain value. The Exponential sequence raises an increasing sequence of numbers to a decreasing sequence of values. See? Simple. Anyways once you have either Passcard or Passcode in hand head on over to Ahto East and enter the Sith Embassy by talking to the Sith Diplomat. The final way bypasses the Diplomat altogether. Go to the Dock (transiting back is fastest) and head on over to the westernmost landing bay. Open the doors for a fight after which you can enter the shuttle and you'll automatically enter the Sith Embassy. Once inside the receptionist won't recognize you and so she calls the Diplomat and all of this security droids which leads to a battle. If you entered in by the landing bay, you will start slightly to the east, so you won't face her right away. However you'll have to eventually face the receptionist when you wish to exit the compound since you can't exit the same way that you entered. Therefore I recommend that you go there right away as it is faster to go this way. Anyways once you have taken care of the receptionist proceed through the door to the north then take the first left. Go down the hallway and take the next door on your left. There is a droid here that you can fix up to help you with the upcoming battle, but it really isn't necessary. 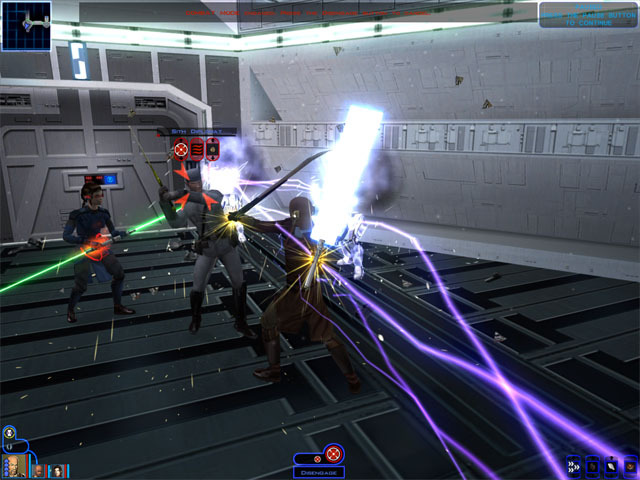 Also using the computer console to the northwest will allow you to corrupt or disable the droids to help make the battle easier. Anyways go ahead and clear the room and take the Data Module on the Broken Droid for 300 XP. While you can exit the base at any time now, I suggest that you take care of the Missing Selkath Sidequest now. This will make the upcoming trial much easier. If you are going to explore this base make sure you watch for mines, as there are five spread across this area. If you didn't do that side quest don't worry, there are still several ways out of this mess. First off do not tell the truth. Most lies will work, as they don't have any evidence since the Sith embassy is not under their sovereignty. You can say that you were working for as a diplomat or that the Sith were trying to lure you to the dark side or that they offered you a job and you refused and they attacked. In any case they won't have enough evidence to convict you and you'll be sent free. Anyways now that that's over return to Roland Waan and present the data module to him for 600 XP. He'll give you access to the submarine bay from which you can go to the Hrakert Rift. Make sure you're ready and head on down. You may want to take T3-M4 with you, hack the computer panel down there, and return and switch out your party members again (you'll especially want to switch T3 out if you are going to face Darth Bandon or Calo Nord down here). Note that this computer panel, unlike others will not reward you XP normally and you won't get any XP for killing the insane Selkath via the console. Anyways proceed forward, mock the idiot mercenary, and continue forward until you get to the east hallway. Now before you can access the second half of the Hrakert station, you first need to get an Envirosuit and a Sonic Emitter. These are located in the Envirosuit Storage room and the West and Central Storage rooms. You can either go to the south hallway and blast your way from the west, or enter in from the east storage room (the one with the faulty droid). In any case open the footlocker in those rooms, and grab the envirosuit in the room with the lockers and then go to one of the airlocks. The airlock furthest to the east is sealed, and can only be entered from the outside. I usually use the central airlock as that is closer to the footlocker to the east. When you go through the airlock you will leave your companions behind, and you will not be able to use force powers while in this state. Now we get to one of those annoying areas which takes forever to navigate. It's quite easy to get through, but annoying nonetheless. Anyways head forward and you'll see a (really dumb) survivor standing around. Talk to him and follow him only to see him devoured by a hungry shark. Continue forward, noting the presence of these sharks. The only way to defeat the sharks in this area is to have that Sonic Emitter that I mentioned earlier. Use it by pressing the same button you do for using stims and shields. If you don't have one then return to the air lock as soon as possible, before you become fish chow as well. There are a total of seven firaxan sharks to defeat, five in this area and two in the next underwater area. Their bite is instantly fatal, so it is best to take them out before they get too close. One is actually hiding in a building (guarding a footlocker) so be aware of that. Anyways proceed forward till you see two paths. You can choose either path you wish, since they both converge to the same location anyways. Usually I choose the south one since it has fewer enemies and you don't have to worry too much about running over a mine on your way to defeat the enemies. Since you are alone it is possible you won't be able to disarm these. Loot everything here. Anyways you have sixty seconds before you die. There are three ways to get out of this situation. All the doors are sealed, but the force field can be destroyed if you attack it. 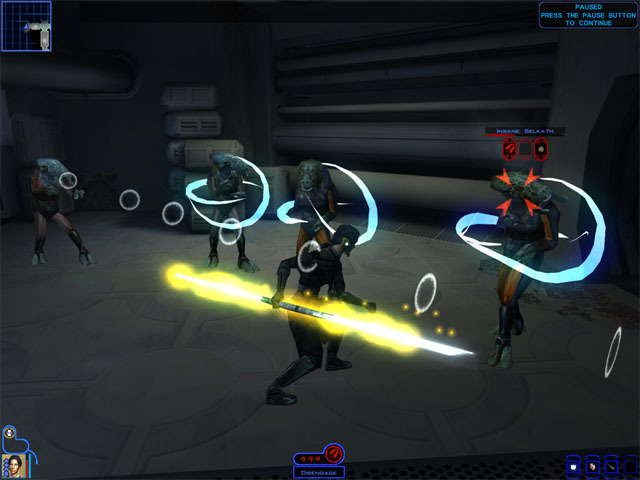 If you are a blaster wielder, a consular, or are otherwise unable to destroy the force field, another option is to use the computer panel to override the depressurization sequence. This will cost 5 spikes, but that can be reduced to zero if you have a computer use skill of 32 (which is only possible for scouts and consulars to achieve). The third and easiest way is to talk to them through the force field and convince them to stop via force persuasion or normal persuasion (medium difficulty). Anyways once you've gotten in they'll tell you about a giant firaxan that is the cause of all this misery. You can either kill it or destroy the machinery that is making it angry. Head north to the Hrakert Rift itself and kill the two sharks there. To the east is the machinery that you will use to decide the fate of Manaan. There is (as typical) a good way and a bad way. The easier (and hence bad) way is to just vent the toxin into the water. This results in the Giant shark's death, opening up the way to the Star Map. You'll gain an additional 1200 XP upon reaching the Star Map and some DSP later on when you talk to Roland Waan if you choose this route. The other way is to destroy the harvesting machine by accessing the fuel tank pressure control and adjusting the pressure to 4 million. The catch is that you have only five actions available to you which are: Fill the injector (3 million), fill container (5 million), empty the injector, empty the container, and finally transfer between the injector and the container and vice versa. This is just a sci-fi version of a commonly known puzzle: How to fill a 5 gallon bucket to 4 gallons with only a 3 gallon bucket and a 5 gallon bucket. The trick is to get it so that the injector is at 2 million. To get the injector to 2 million, first fill the container to 5 million, then transfer 3 million of that to the injector, leaving 2 million in the container. Dump the injector and transfer from the container to the injector. Then Voila! you've done it! Now just fill the container and transfer 1 million to the injector to get to 4 million. Sit back and watch the fireworks and enjoy your 1500 XP. Whichever way you chose the path is open so go forward and get the star map for another 2000 XP. Now all you have to do is to return to the surface. However you may meet Calo Nord or Darth Bandon waiting for you if you have seen their cutscene. They will be waiting behind the doors past the Security Computer Room. For strategies on dealing with these idiots see my "Big Bads" page on Calo or Darth Bandon. Once these guys are taken care of return to the surface and Roland Waan will ask how it went, netting you 900 more XP, 500 Credits, and a Cardio Power System. Proceed forward and exit the embassy and you be taken by the Selkath authorities yet again for another trial. How you respond to their inquiries during this trial will ultimately depend on what you did down at the rift. If you destroyed the Harvesting Machinery, just honestly tell them everything that happened, and you will be set free. Easy. On the other hand if you killed the Giant Firaxan you do NOT want to tell the truth, otherwise you will be permanently banned from the planet. If there is nothing else for you to do here you may not mind, but still it is best to have your options open. There is one dialog path that you can take to prevent them from kicking you out. You can lie to them all you want, but they will find out the truth eventually, however how you go about telling them is the key. Go ahead and tell them that the harvesting machinery released toxins into the water. Next (after they get all pissed off) tell them that it isn't your fault, and that the harvester malfunctioned. This won't convince them, however it does give you a dialog option not otherwise available. That is where you say that you did it, but you know too much. Follow this with saying that you will tell everyone that the kolto is gone if you are banned. This will make them unable to retaliate and you will be free to do as you wish on Manaan. There is one benefit to choosing to destroy the kolto, that is that all medpacs cost a great deal more, meaning you can sell them for a great deal more as well. Anyways go ahead and finish any side quests and proceed to your next destination. Unlike Tatooine and Kashyyyk the encounters here do not vary according to level. Therefore the difficulty only gets easier as you level up. That said Manaan is quite easy even for those at level 12. Since there are no large expanses there is no fear of getting overwhelmed. Even the Dark Jedi don't pose that much of a problem, as they only come in groups of three. Melee and Attack builds: The spider droids here on Manaan can pose a problem if you don't have access to disable droid, as they are quite resisitant to energy attacks. So long as you can disable them somehow, they cease to be a threat. The meatbags on the other hand, pose no problem and should go down without a struggle. Consulars: As above, the spider droids can be annoying, but less so for a consular, so long as you have the required meat-shield in front. Enemy Jedi can be a hassle, as they tend to focus on your consular. Try to debilitate them before they take out your low VP characters. Force Choke and Kill work especially well to debilitate and damage the Dark Jedi. Also try to take down the grenade lobbers as soon as possible. Unlike melee characters that close in quickly, the Consulars usually just stand around blasting away, meaning that sometimes a lucky grenade can take you down if low on VP.